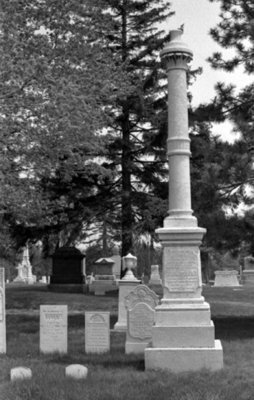 A black and white photograph of Peter, Margaret, Jessie and Reverend Robert H. Thornton's gravestones in Union Cemetery, Oshawa, Ontario. Reverend Robert Hill Thornton Family Gravestones, Date Unknown, Brian Winter. Whitby Archives A2013_004_458D.